Corning just announced at the CES 2014 in Las Vegas last week that they have developed a next generation Gorilla Glass. 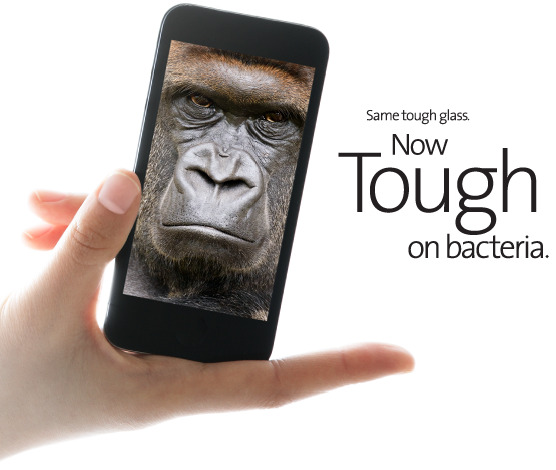 This development will protect users from microbes on their smartphone screens, Corning unveiled the Antimicrobial Gorilla Glass, thanks to ionic silver, a common antibacterial agent which the company was able to incorporate in the protective glass without the side effect of compromising its super strength glass product. This germ-busting technology was first announced by Corning for about a year ago that they were working on this first EPA-certified cover glass which they hope will find its way to the future smartphones. Once it is in action, this technology will inhibit the growth of algae, mold, mildew, fungi and bacteria on smartphone screens. It's important to take note that the company does not guarantee 100% germ-free screens but their goal is to lessen the increase in number of bacteria on those devices for as long as our smartphone lives. Everyone knows that every surface in the world has bacteria or tiny living organisms which many of them if not most are threats to humans' health and we admit that our smartphones or devices are not excused from this kind of truth and it's really a good thing to see companies that are not just sporting new innovations and aim to gain bigger sales figures but also after the safety of its customers. Since it is a first of its kind, we really cannot expect this one to work perfectly but this is something that users will have an assurance that using their future smartphones will make them safer from bacterial infections. And I do not think that this company will have a hard time convincing manufacturers to accept and include this new line of Gorilla Glass into their new products.